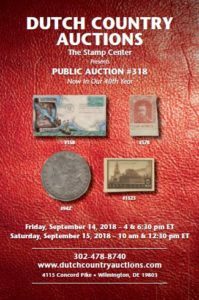 Our September sale #318 is one or our largest sales ever with 1882 lots! In our opinion, it is loaded with interesting items, good finds and large lots that will provide hours, days, and months of treasure hunting. In our cover section we have an excellent collection of advertising covers, another of locals, airs, naval, space, topical, Zeppelins, FDC (U.S. & WW), postal stationery and meter mail. The U.S. FDC are highlighted by Colorano Silks, Collins, Maslow and Risko Art as well as many large accumulations. There is a very strong selection of postcards and the foreign covers feature nice groups of POW and Russia. In the U.S. singles section is a #28 unused, #84, #85E, #130, #135A, #143, #244a, #K1-18, #PR31 w/ certificate and Hawaii #7 and #27a. The sale offers a broad selection of U.S. gold, some better date Morgan and Peace dollars, and a number of very nice 19th century type coins and 20th century keys. Our worldwide section is loaded with better singles and sets like India’s Gandhi, Russian varieties and highlighted by Italian Offices in China with Raybaudi certificates. Do you like large lots? We have them: U.S. collections, accumulations and worldwide country collections, topicals and large lots! Chocked full of goodies!